Devil’s food cupcakes are my very favorite. This recipe is so dark and rich, no other cupcakes can compare. This is my go-to recipe for special occasions. If you make this devil’s food cupcake recipe, you will NOT be disappointed. A few months ago, we had a daycare home tour in our childcare organization. I served these devil’s food cupcakes and some garden fresh pico de gallo for some fun even snacks. My friends were crazy for these cupcakes and were eager for the recipe, so here it is. Enjoy! If you serve these devil’s food cupcakes at your next event, you’ll be the life of the party. Real food ingredients taste so good. You will be glad you tried them and they’ll be your go-to cupcake recipe too! For tips on baking the perfect cupcake, click here. 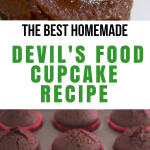 Another great thing about this devil’s food cupcake recipe, besides the amazing flavor, is how simple they are to make. You can mix everything in one bowl for the cake, rinse it out, and use it to make the frosting. I love one bowl cake mixes! No fuss, no muss. Rich, dark chocolatey cupcakes that will please your family and friends for sure. In a bowl dump sugar, flour, cocoa powder, salt and baking soda. All at once add milk, sour cream, coconut oil, and 2 tsp vanilla. Add eggs and mix 2 minutes more. 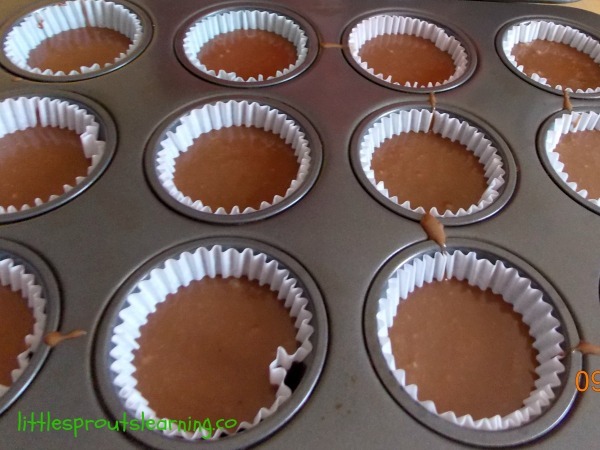 Pour batter into cupcake papers to 2/3 full. Bake at 350 for 18 minutes or until toothpick comes out clean. For Frosting whip butter until light and fluffy. Add cream, vanilla, salt and 1/2 cup powdered sugar. 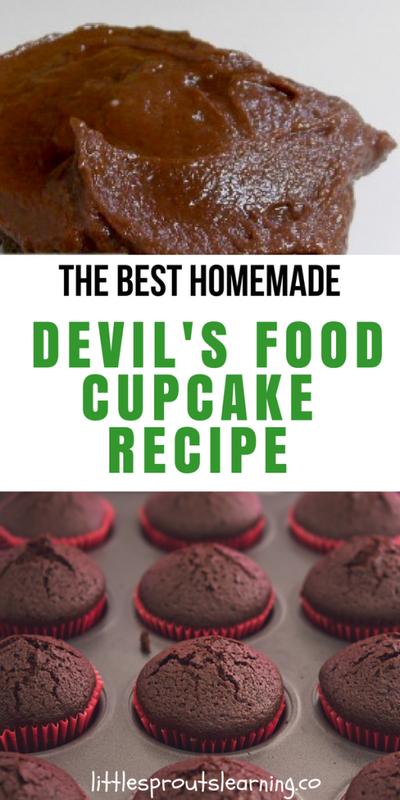 I hope you get the chance to make this devil’s food cupcake recipe for your family soon! They’re going to love them.